really highlights a company on top of their game production wise. Arrow was introduced in the 1975 wave of characters, all of which were superior design wise, he is the only DC character to surface that year and was the last 8″ DC hero produced (The Teen Titans were 6″ folks) Ollie seems like a somewhat logical choice for Mego, he had recently made a guest shot on the Superfriends and was a regular in the Justice League books at the time. 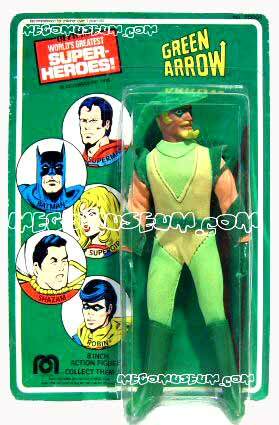 Mego even made his sidekick Speedy in 1976. 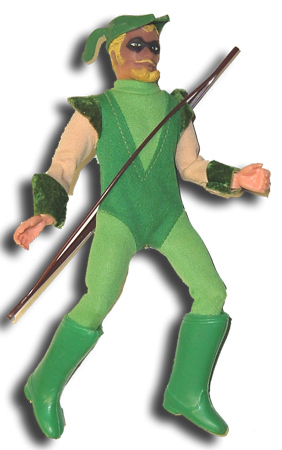 Mego Green Arrow used Long John Silver as a base. 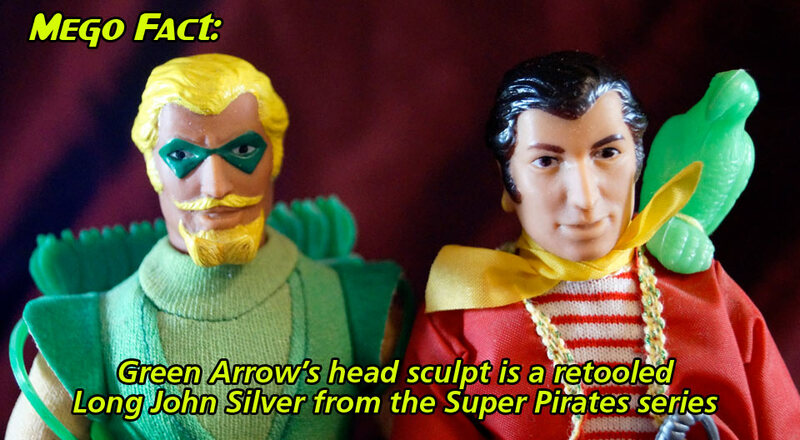 Whomever sculpted the Mego Green Arrow simply repurposed the head sculpt of the Long John Silver figure from the previous year’s “World’s Greatest Super Pirates” line of figures. 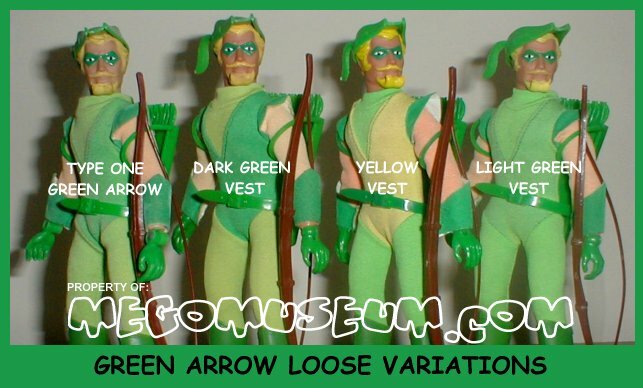 This chart produced by Tom shows the many variations of Mego Green Arrow, the figure was released on both body styles although GA is more commonly found on a type 2 body. 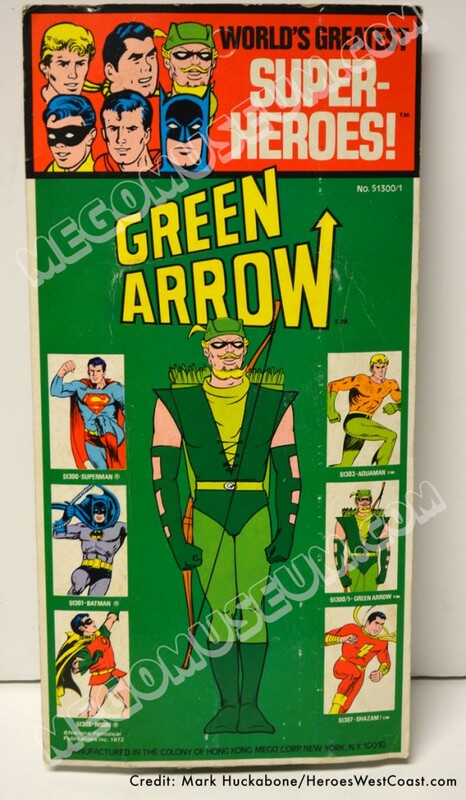 The Green Arrow’s arrival circa 1975 signifies a change in the Kresge Header for DC Characters, this is one of the toughest Kresge cards to find. 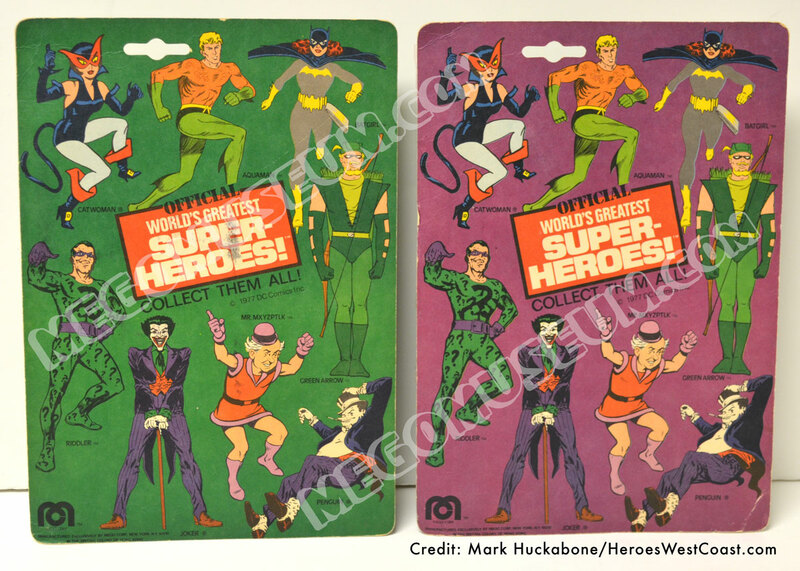 It also suggests that Green Arrow was released in late 1974 as none of the other figures from the 1975 wave (such as Falcon) were released on Kresge cards. 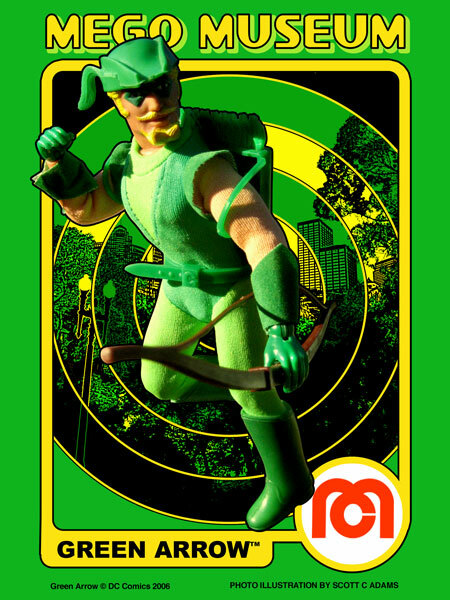 This mint example of a very rare 1976 US Card shows a Green Arrow whose dark green suit has, typically,faded to light green. Collection of Scott C. Adams photo by Benjamin Holcomb, World’s Greatest Toys. 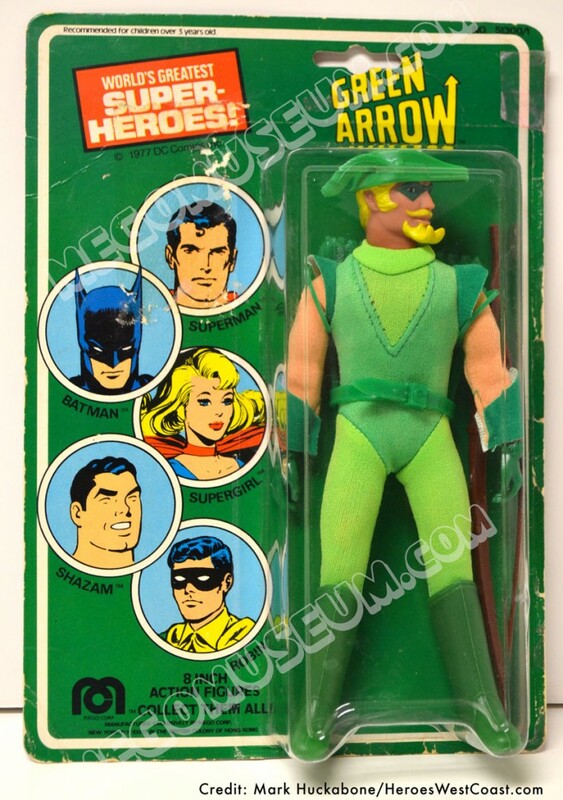 Green Arrow on his US Card is a very difficult item to find, let alone a yellow vested version as on display here (Thanks go to Tom for this great photo). 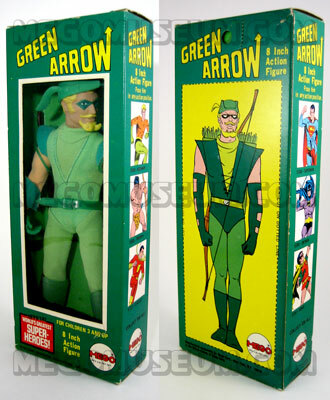 Above are 1977 “A” carded versions of the Green Arrow, the most notable feature of these figures is the butterfly punch and the thinner plastic bubble. While both backers are non glossy on these versions, what’s unique about the card on the left is it’s purple backer, proving to many that there was an Aquaman in this A card series as well..
they were cut from assortments. 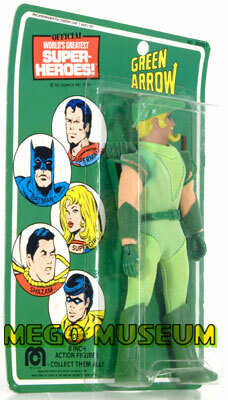 Other known red carded figures are Riddler, Batgirl and Aquaman. Ledy Megos. 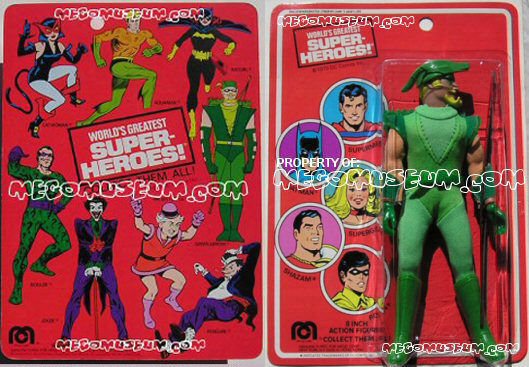 Photo courtesy of Foreign Mego Archive. 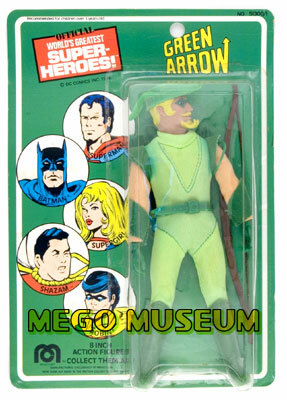 Mego gave Green Arrow a set of wheels as well, click on the image to check out the Mego Green Arrow Car! 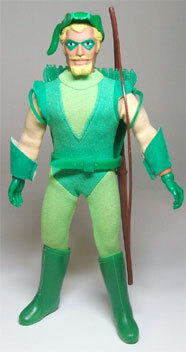 Green Arrow’s suit has been factory reproduced by Doctor Mego. 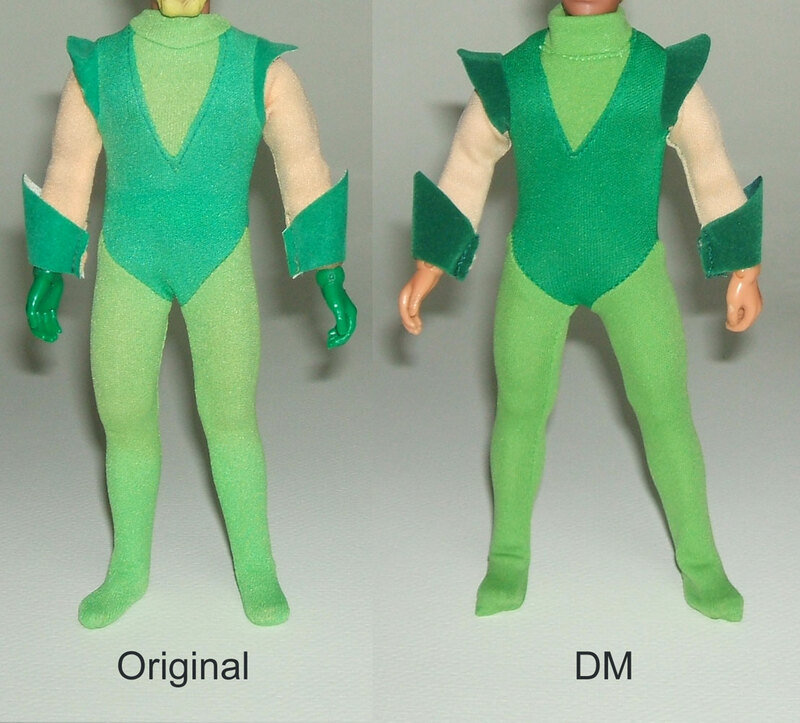 The colors are a little different on the repro, but it’s difficult to state the differences since original Green Arrow suits, probably due to fading, vary in color. The cuff and shoulder piece material on the repro is darker green, and green on both sides, where as the original is white on the back side. The other big difference is the collar area. The reproduction is rounded all the way around the collar and the original comes to a point in the front. 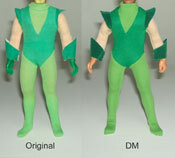 Green Arrow’s Quiver is unique to the character and has been factory reproduced by Doc Mego. 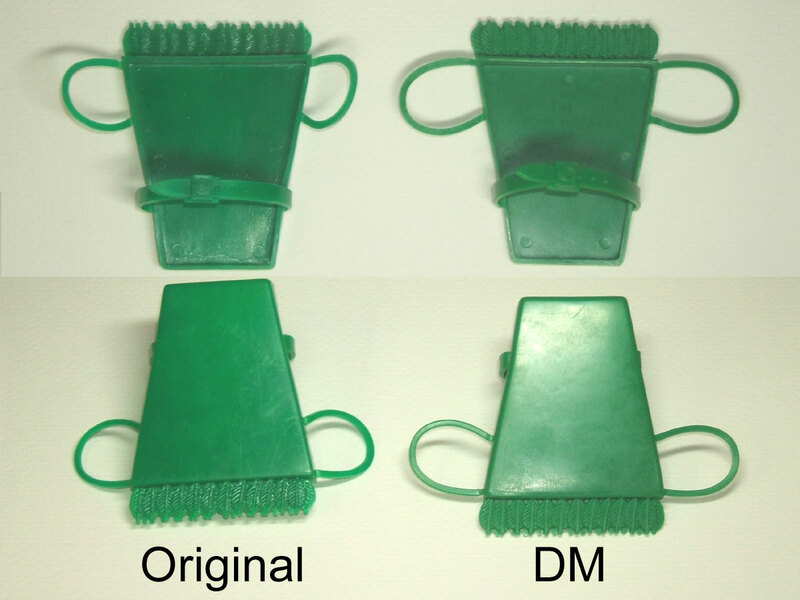 The reproduction is very accurate with a slight difference in plastic material used. The repro is marked DM on the back. 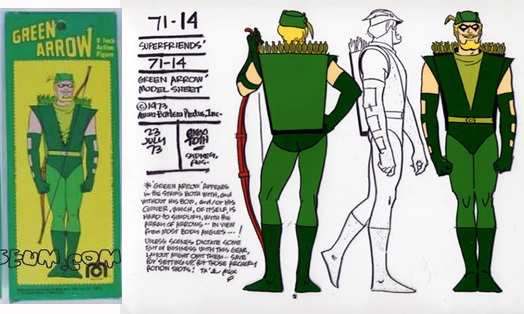 Green Arrow’s green hat is unique to the character, although the style was also used for Speedy. It has been factory reproduced by Doc Mego. 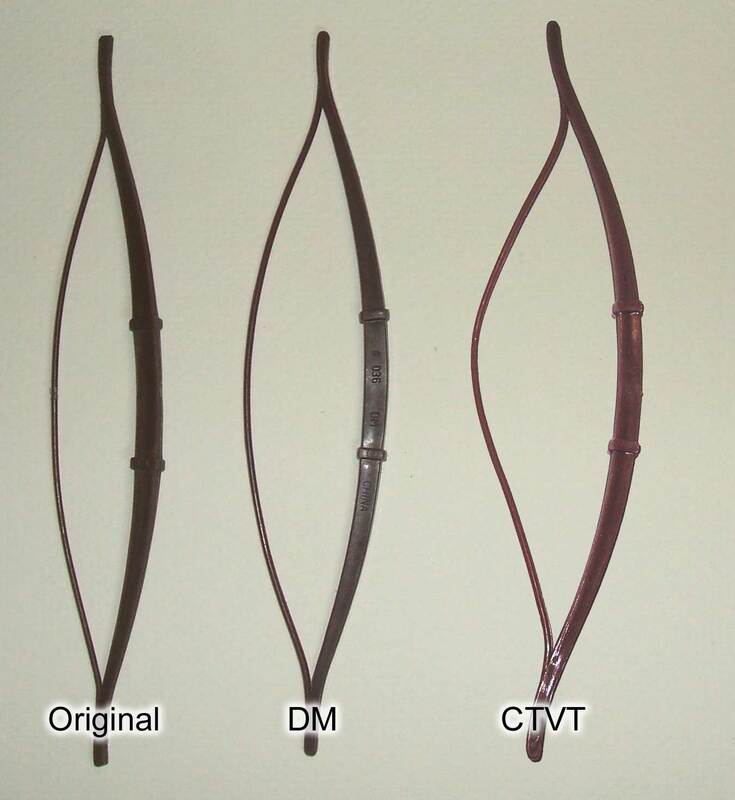 The reproduction is very accurate with a slight difference in plastic material used. The repro is marked DM on the inside. 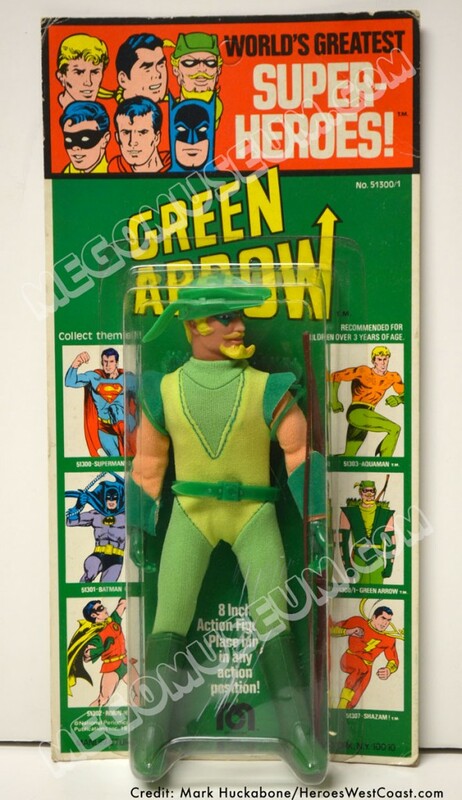 Green Arrow has the same bow as Speedy and a couple characters from the Robin Hood line and has been very accurately factory reproduced by both Doc Mego and Classic TV Toys. 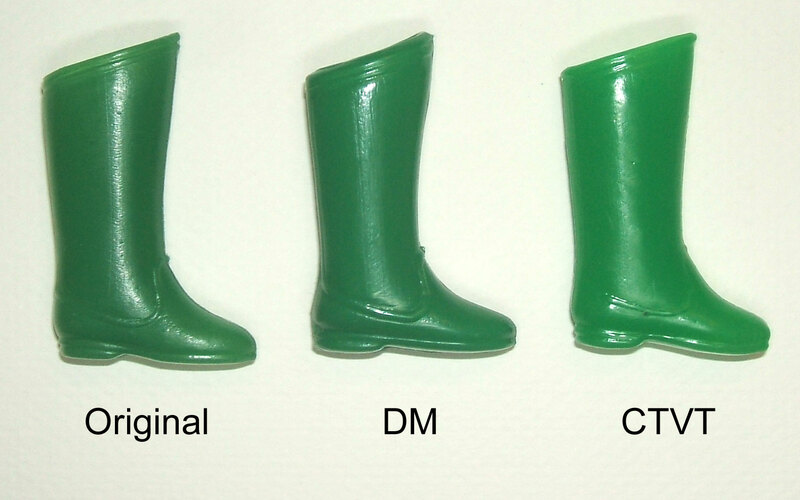 Doc’s version is very close in appearance but is a touch darker in color. It is marked DM on the side by the handle. 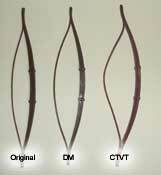 CTVT’s version is lighter in color and marked CTV by the handle.